Qigong is a method of healing that activates the bodies own medicine. Within each system of Qigong there are common but very specific methods that help build a solid foundation to enable each and every student to grow with their practice and develop a greater sense of well-being and peace of mind. Chi-fit classes concentrate on these very foundational methods so each and every experience provides the most positive results and a future of continued health and practice. Once you have a solid foundation you can take your Qigong wherever you choose to go with it. "This is the first year in my long teaching career that I have not missed a day due to illness... Qigong is a life changer!" Not only does Chi-Fit Nourish the Mind and Body but it also improves Sports Performance, Relaxes and heals Injuries and promotes structural connections for better performance. Chi-Fit Strengthens and tones muscles while relaxing tension in the musculo-skeletal framework. 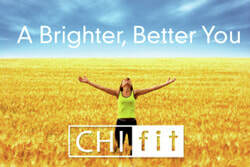 Chi-Fit is a great way to help harmonise emotional stress. Our lives can become very busy and Chi-Fit classes provides emotional space to slow down and breathe. Chi-Fit really does make a difference! Take your biggest breath ever! Chi-Fit teaches you how to gain back your own personal space and allow time for your own growth and daily happiness. Chi-Fit at its deepest level is a system for self healing. Qigong teaches us to gently release tensions and strengthen the mind. Over time and with regular practice physical restrictions caused by emotional trauma can easily dissolve in such a subtle way that it makes this practice a great additional aid in the journey of self development and emotional health. Quite often through lifes challenges we become disconnected from the people and activities we love. Through regular daily practice (just 15 minutes!) of Chi-Fit we can return to the person we were when we were happy and balanced and begin feeling connected to others and the things we do everyday. Chi-Fit can literally put the spring back in your step and the spark in your life! Age is just a number when you practice Chi-Fit classes. Why Chi-Fit & Qi Gong? Chi-Fit has solid foundations in Traditional Chinese Medicine bringing over 3000 years of effective techniques to help each person feel the Harmony and Vitaility of Greater Health. Just 15 Minutes of Chi-Fit a day can help maintain health, reduce fatigue and increase energy! Chi-Fit is a fresh and relevant system deeply rooted in Traditional Chinese Medicine. Classes are simple, functional and therapeutic. Each class looks at the WHOLE body and mind with Movement Meditation, Mindfulness, Spinal Health and Massage. Chi-Fit Health Classes provide all the benefits of Yoga, Tai Chi, Pilates and much MUCH more! Author and Chief Instructor Christopher David Handbury has been treating and teaching people to improve their health for over 10 years using Acupuncture, Tui Na Massage and Medical Qigong. "Running a successful health clinic has given me extensive insight and knowledge of what is required to live a more harmonious life with reduced pain, balanced emotions and a means to self heal for a life full of energy and enjoyment. Above all else my goal is to pass on my knowledge so others can make positive changes to their lives"